When you enter a restaurant in Germany it is customary to choose your own seat and sit down. If a waiter or waitress sees you enter, they may greet you and suggest a seat, but usually you are on your own. The exception to this is formal fine dining restaurants. You may see a sign on some tables that says "Stammtisch," which means this table is reserved for regular guests. In other words, don't sit there. If a restaurant is crowded, it is normal custom to share a table that has empty seats. You would say, "Ist hier frei?" (Is this place taken?) A response would be "Bitte!" (Please), meaning please go ahead and sit down. Once you sit down, usually you will find that the other people will politely ignore you. If they engage you in conversation, go right ahead. Whichever party leaves first, should offer "Auf Wiederschen!" (good bye). After you have sat down, do not expect ice water to appear, ice is not common in drinks and water is only served if requested. If there is a bread basket on the table, you may help yourself, but know that you are charged for eating the bread. 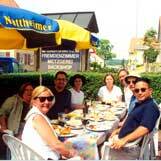 Germans, like most Europeans, enjoy dining and consider it a social event. With that said, do not expect to find speedy service. You may feel that your waiter is not working fast enough, but the reality is that they are trying to not rush your experience. Most items are made after you order them, so there may be some delay from the time you place an order to the time you receive it. When you have finished and you are ready to go, you will have to ask for the check by saying, "Die Rechnung, bitte. (The receipt, please)" The server may ask, "Getrennt oder zusammen?" (Seperate or together). Almost always you will be asked, "Hat's Gescmeckt?" (Was everything okay?). TIP: When you ask for the check, the server will usually verify what each person had, and then add the bill by hand on a piece of paper. There will be no formal register receipt like you expect in the States, unless you are using a credit card. TIP: Tax and tips are included in the prices on the receipt. You do not need to leave any additional tips. However, if the service was excellent you can round up the total and tell the server to keep the change. It is not the custom to leave a tip on the table. TIP: On a table in a restaurant you will find a tall circular bucket, this is for table scraps or trash. TIP: If you are a strict vegetarian, you should learn or carry the following phrases with you. Ich bin Vegetarier. - I am vegetarian.